Mum on the Run day 13 - Time for Tea! Today I am wearing a tea dress - appropriate really as my "afternoon tea" started at 8.45am with Cadbury's chocolate animals, soon to be followed by home made lemon cake and flapjack. Not a particularly healthy start to the week - but that's the great thing about dressses; no waistbands! 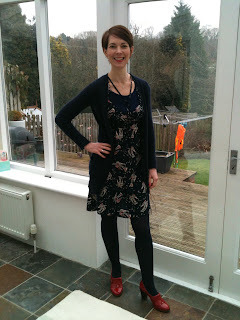 I love dresses as they are such an easy outfit -and no wardrobe should be without a good day dress. I layered a long sleeved top underneath for - yes, you guessed it - warmth and also a boyfriend cardigan over it, to keep it casual. I love boyfriend cardigans but some can be hard to wear as they finish out your widest point. Wearing one the same colour as the dress meant that the divide was less obvious than it had been with a pink one that I had had on previously. I sometimes wear a shorter fitted cardi with this dress and put a skinny belt over the top, just to dress it up a bit. The red shoes added a bit of height and colour but later on in the day I swapped them for my biker boots - which I was glad about as I had to run down the High Street to make it to ballet on time. Mum on the Run day 12 - A dress at last! The day has finally arrived - I am out of my jeans and into a dress - one which I had actually forgotten that I owned and which I discovered this morning. A definite bonus for a Sunday morning. I had previously only worn this knitted purple dress over a pair of jeans - largely because it is a fine knit and therefore a little too see through for my liking - but a black slip taken from another dress soon solved that problem. A stripey Gap top which I layered underneath the dress, plus thick tights, biker boots and a long pendant completed the look for me for today. I was warm and snuggly all day long and the addition of an apron when I was cooking kept the necklace under control and stopped the dress from being ruined. 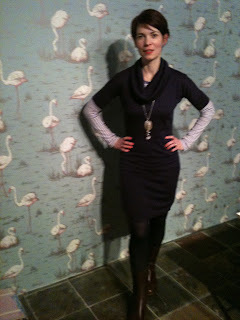 Outfit: Sweater dress Gap, Striped top Gap, Necklace Jigsaw, Biker boots Hobbs. I really should stop wearing jeans now but...it is the weekend and as I can't wear jeans whilst with clients, I am enjoying wearing them whilst it's the school holidays - that's my excuse anyway! In any event this outfit is a dress - with jeans underneath it, so the jeans only count as an accessory (sort of). I like this way of wearing jeans but you just have to ensure that any dress that you are wearing is above the knee and that the shape of the dress and the shape of the jeans work together. After the photo shoot this morning I had a quiet day at home just pottering so the demands on my outfit weren't huge but still, I wanted to feel as though I could nip out should the need arise without changing my outfit and still look OK.
Today was the day that I was let off from wearing jeans so what did I do? Wear jeans. It was an early start as I was taking my Mum down to London to see her sister for the day. I have a cold and couldn't face the whole dress/skirt/tights debacle so kept it simple with jeans, a long sleeved top, jumper and scarf. The spots on the jumper and stripes in the scarf and top served to keep the look jolly - despite my thick head! Wearing stripes as an accessory, or just peeking through as I have done above is a nice way to wear them - particularly if you feel that you are someone who can't wear stripes, despite liking them. 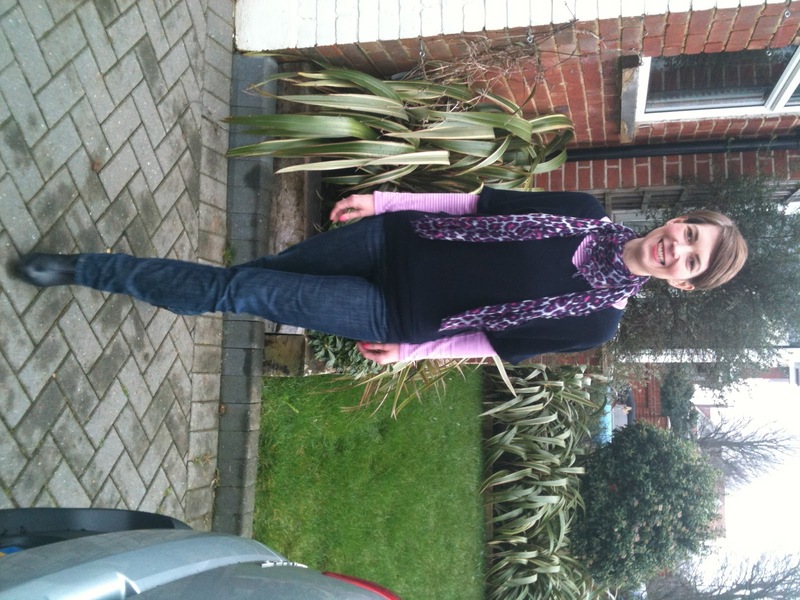 Outfit - Jeans Mango, Top Jigsaw, Jumper Cos, Scarf Zara, Desert boots New Look. So here we are, day 7 and today I have entitled the post "a little bit of everything" because, apart from the bag, you have seen it all before. My thinking went like this: the forecast was warm and so I wanted to avoid wearing a jacket for my first outing of the day, which was a quick trip to the Bullring to buy something for a photo shoot that I am doing on Saturday - hence the layers. I needed to be "hands free" though as I had the little one in tow and I didn't want to put her in the pushchair,so that meant the cross body bag - added to which the colours in it pulled the outfit together. Later on in the day we did Waitrose followed by a trip to feed the ducks and then on to the Botanical Gardens near to us. I swapped my red shoes when I did the ducks and the Botanical Gardens trips as I wanted to be able to run properly, should the need arise. So on went the sequin converse. It was also getting chilly by then so on went the navy blue parka too. I decided to roll the jeans up really just to give a different look to them. 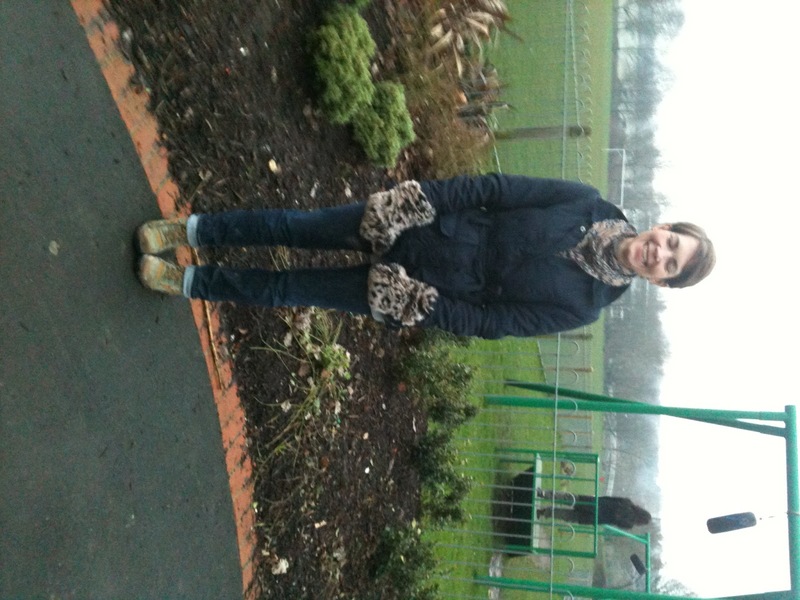 For me, the outfit did the job -warm, practical and easy to adapt later on in the day. OK so the shoe adaptation wasn't perfect but as a Mum on the Run, sometimes I have to make compromises - or spend the entire day changing outfits! 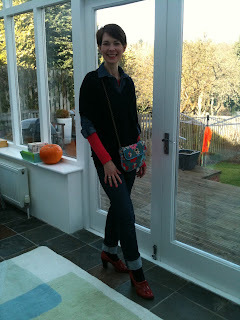 Outfit: Jeans Gap real straight, Long sleeved coral top French Connection, Denim shirt Gap, V neck jumper White Company, Bag Cath Kidston, Shoes Kurt Geiger. So, to day 6 of jeans only. So far I have worn skinny jeans, straight jeans and bootcut jeans. Today is the turn of a more flared style of jean. On my top half I have gone for a fitted look as a contrast to the wider leg jeans. I am wearing a cream lace top, a boyfriend cardigan and leopard print belt. The lace top and leopard print belt are subtle but make the outfit more interesting than it would otherwise be. Without the cardigan and the belt I would definitely be headed towards a 1970's silhouette as the top is slightly A line, but I will have to wait for the warmer weather before I lose the cardigan. The jeans are fairly long so I have had to go for a medium height heel - which was fine for my trip around the Sealife Centre! I have chosen my red patent shoes to add colour but also because they are comfortable. Remember the brief trip to Bicester that I mentioned? Well, the result of that trip is clasped in my left hand. Can you believe that people were in the Mulberry shop buying three at a time? I am planning a return visit soon - not for me I hasten to add - but if you would like me to pick up a bag for you, please let me know. 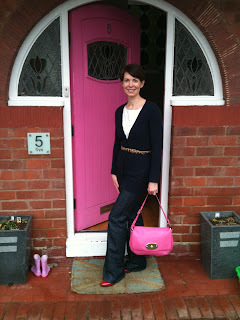 Outfit: Jeans Mango, Lace top Monsoon Fusion, Cardigan Zara, Belt TopShop, Shoes Kurt Geiger, Bag Mulberry. So, to day 5 of jeans only. Today I teamed an animal print scarf with a striped top - maybe not an obvious combination but because the colours in the scarf and top tone together, it worked. Mixing different prints, or different fabrics, is a good way of introducing interest into an outfit without the need to accessorise too much - which is what I am aiming to achieve this week - simple practical dressing that works with children. Having considered my wardrobe recently, and having decided the one thing that I really didn't need was a navy jumper, I promptly went out and bought this one from the White Company. It's fairly loose for me but I liked the v-neck, batwing sleeve and the fact that I could layer lots of different style tops and shirts underneath it. Again it is a casual look but I have kept the bottom half of the outfit more streamlined, which works better for me. If straight or skinny jeans don't work for your body shape, this combination would work equally well with a boot cut or flared jean but you may want to swap the bat wing top for one which is slightly more fitted. 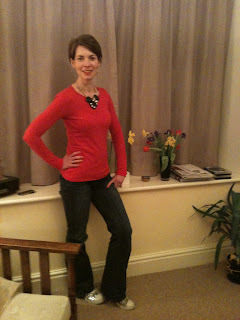 The outfit worked for the day in that it was comfortable and I liked the colour combinations. Next time I will probably layer a thermal top underneath - but that's just me! 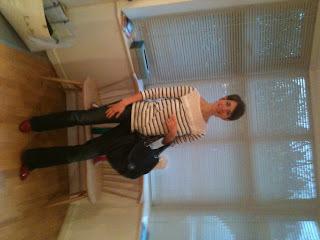 Outfit: Gap straight jeans, White Company jumper, Gap striped top, M&S scarf, Oasis boots. Today was the day when I knew that there would be no holds barred running around - and I was right. Talk about Mum on the Run! Not being a fan of jeans with running trainers, I went for the next best thing - converse style pumps. I read in a magazine that it was not the done thing to wear converse in January as it was too cold. However I figured that February was fine and that it was more important that little one didn't get squashed whilst we were out walking. In any event running after her kept my feet warm. Given that it was also a cold grey day I wanted to brighten things up, which I did with a cashmere jumper with a long sleeved top in the same colour layered underneath. I also added a statement necklace to lift the outfit, which was short enough not to hit the little one in the face when I bent down to her. I am pleased to say that it all did what it was meant to for the day - unlike others I could mention. 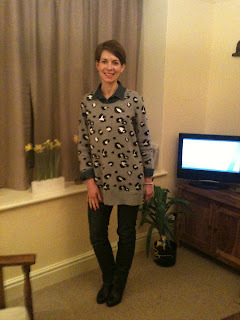 Outfit - Gap jeans long and lean, French Connection long sleeved top, Jigsaw cashmere jumper, Jigsaw necklace, Marks and Spencer sequin pumps (children's). So, day 3 of wearing just jeans. As you know, I have been on a trip so I am doing a bit of catching up with the posts. This is my jeans with a chunky jumper look. It was chilly where I was so I snuggled up in this oversized jumper, which I love. The white on the print isn't quite as dominant in real life and the jumper also has sequins on it. Blingtastic! Because the jumper is oversized, I needed to keep the jeans fitted and I added my comfortable, but high, boots to keep the look from being too casual. I have worn the denim shirt underneath that I also wore on day 1 but this time, rather than being a main feature of the outfit, it served a functional layering purpose. You might not be able to see too clearly but I am also wearing flouro pink nail varnish for a splash of colour - flamingo pink by Barry M.
Later on in the day we went for a hideously muddy walk so the high boots were swapped for walking boots, a navy parka, animal print scarf and huge (and hugely warm) gloves. You can see the pic below! Day 2 of wearing only jeans - OK well not literally, but you know what I mean! Tomorrow (Sunday) I will be visiting my sister so I am doing the post a day in advance. Today it was the turn of bootcut jeans and tomorrow it will be the turn of skinny jeans. Anyway, I have gone for a kind of alternative rock chick look here - instead of wearing all black, I have gone for a cream/brown/navy combination, which I find a little softer. A slight story here - the jumper, which I love, shrank in the wash. The shop was unable to replace it for me as they had sold out so whenever I wear it, I layer a couple of longer tops underneath so I don't get that embarrassing flash of flesh and nor do I keep wriggling and trying to pull it down (well, only because I know that it doesn't work)! So, my first of seven days of wearing jeans! Today (Saturday) we were off to see family and we had a fairly early start of 8.30am, so not much time for faffing! Our trip to see family was followed by a quick trip to Bicester Village. It is amazing what you can accomplish in 20 minutes - but more about that another time! 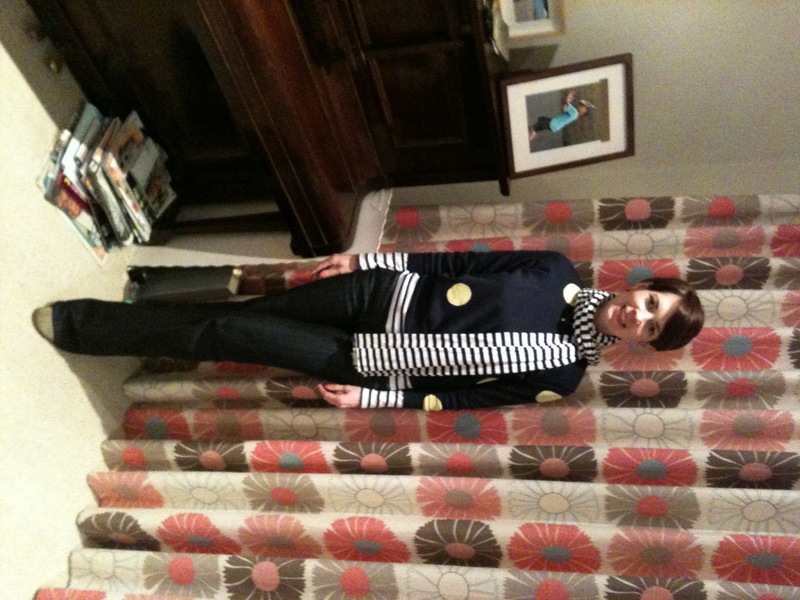 My first outfit comprised Gap jeans plus a new striped top from H&M (which was a bargain at £9.99) - with a camisole layered underneath for warmth. I love stripes and this top not only has stripes but broderie anglaise too - which I also love as it is so pretty. I used my big blue canvas bag as I can chuck everything in it - handy with all three monsters in tow - and my red patent shoes for colour, comfort and a bit of leg lengthening! For me it totally served the purpose for the day - warm, comfortable, practical with a bit of detail in the stripes and colour in the shoes. The heels were high enough to make me feel smart but not so high that I couldn't run around (the shops) in them. As it is half term next week I will be at home with our youngest, whilst our eldest two are off skiing. Our youngest is still only three - and whilst naturally she is "a big girl" there is still a certain amount of nose wiping, sticky fingers, lifting in and out of car seats, sticking, painting, crawling on the floor and tripping over toys involved. For the next 7 days I will wear nothing but jeans. 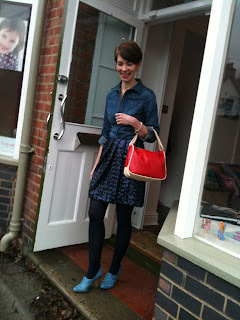 Each day I will show you how to style your jeans in a different way - and they will all be daytime looks. Although you may not all be in the same position as me next week, I have no doubt that the majority of you will wear jeans at the weekends and so these looks may keep you going for a while. Wearing jeans for 7 days will be a challenge for someone who likes her skirts and dresses but I am looking forward to it. It has always been the intention that Mum on the Run posts should be honest and represent what I am actually wearing for the entire day - shoe swaps aside. So forgive the possible lack of cocktail rings, necklaces and other accessories that I would normally wear when I am styling people. In my experience long necklaces and three year olds can result in a black eye for the three year old and strangulation for me. My philosophy is to style women according to their figure, their lifestyle and their budget. For me, for next week at least, lifestyle will definitely be the dominant factor! Oh, and a quick word about jeans. I have found that most women don't need to spend a huge amount on jeans to achieve the perfect fit. A combination of Gap, Hobbs, Oasis, TopShop and Karen Millen usually does the job. Any queries, please just ask. This outfit is designed to show you how to wear utility trousers in a more "dressed up" kind of way, rather than just with boots and a T. I have put them with a white shirt, fine v neck jumper, necklace and heels. Later on in the day the heels can be replaced with boots. Utility trousers are a good alternative to jeans and there are many copies of the original J Brand Houlihans out there. The day that I wore this outfit I had a business meeting first thing, followed by a trip to Pizza Express for lunch with some friends. The afternoon was spent doing the usual school and tennis run and it all worked fine. 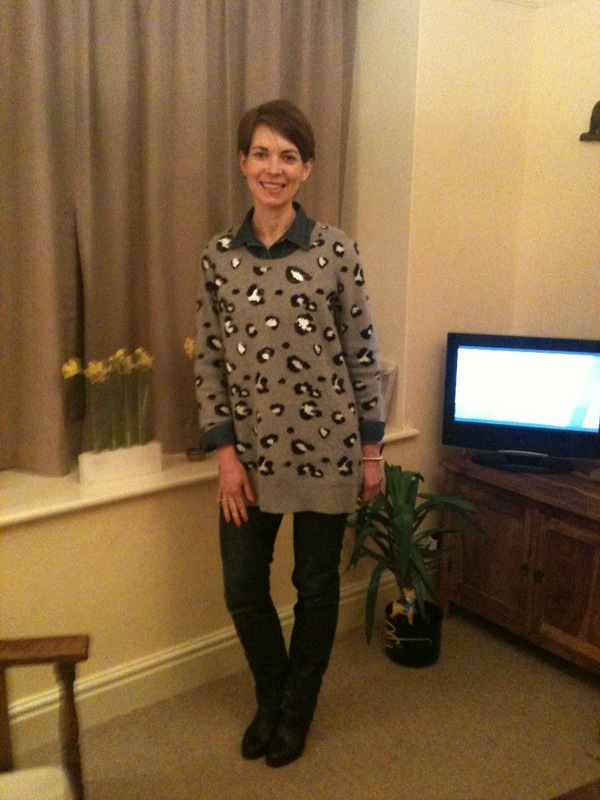 The trousers are from the Gap, shirt from a boutique, jumper Hobbs NW3 sale, shoes Hobbs NW3 sale, necklace from Jigsaw. The day that this photograph was taken I went from a business meeting, to the shops for work, collected the children from school and then took them to tennis. The look that I have gone for is daytime sequins with an injection of colour in the shoes and the handbag. I bought the skirt at Christmas time but hadn't made use of it so decided that it needed an outing. I have dressed the skirt down by putting it with a denim shirt - this idea works with most luxurious fabrics such as lace, tweed, leather - and I have layered a vest underneath the shirt for warmth. I am also wearing thermal navy blue tights. 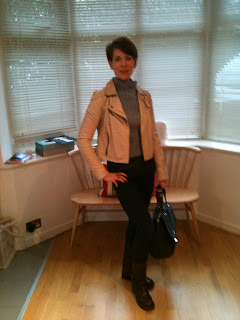 After leaving my meeting I swapped my high shoes for Hobbs biker boots, which I had in my car. The shirt is from Gap, the skirt from Coast, the shoes Hobbs NW3 and the red Miu Miu bag was a bargain in the Harvey Nichols sale about 8 years ago. The tights are from M&S. Mum on the Run is a new daily feature on my blog. Each day -well, that is the plan - I will post a picture of what I am wearing. As a "Mum on the Run" I face many of the challenges that lots of you face on a daily basis - too much to do, too little time. 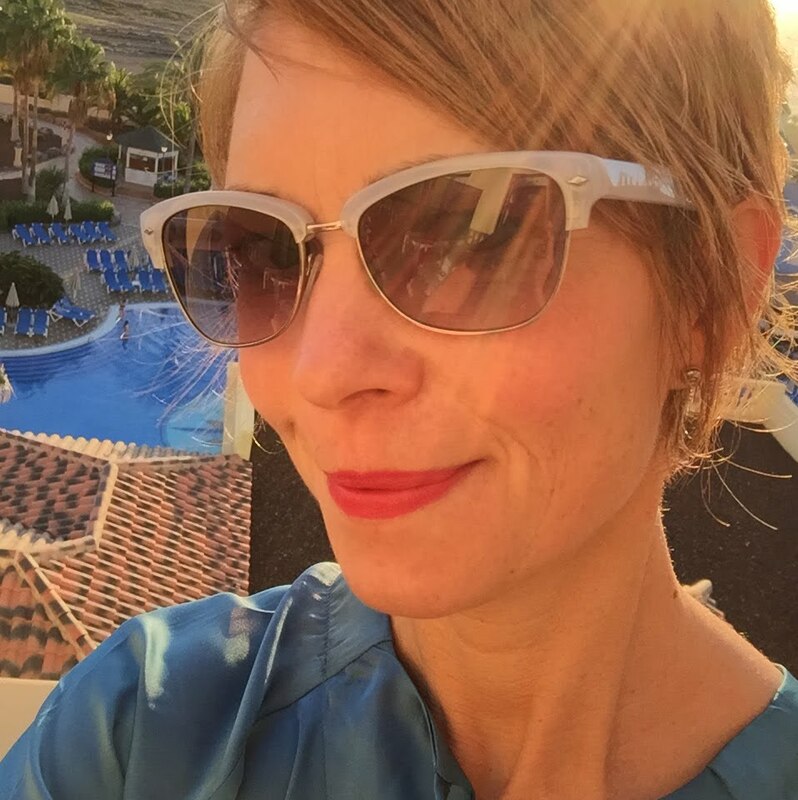 Like you, in any one day I may go from a business meeting, to meeting a client in the shops or at home, to doing the school run, dashing home and doing dinner and homework before getting on with the evening chores. I am lucky in that styling people is my job - so I ought to be able to do it for myself - but there are always hiccups along the way - right coloured tights, wrong place (the wash maybe), right heel height, wrong shoe. Black outfit but only a blue coat to go with it, the various lengths of clothes not quite working. Does it matter? Together we can find out. There are lots of blogs - many of them fascinating - where women have done something not dis-similar. At the Uniform Project, Sheen Matheiken wore the same dress for a year. Others create as many different outfits with as few a pieces as possible. I am not trying to do either - first, because they have already been done so well but secondly because I wanted this to be a little different. There will be successes and failures but what I hope to be able to do is to give you some ideas on how to dress stylishly without breaking the bank, using pieces that you already have in your wardrobe. Sometimes you may like the colour combinations, sometimes not. Sometimes you may like the principles of the outfit but not the outfit itself. My advice is to take on board the positives and leave the rest. If nothing else, I hope that it gives you a giggle. Fashion is meant to be fun! A word of warning - I fully expect some of the photographs to be less than perfect but that's fine by me. Whoever happens to me near me on a particular day may get the job of photographing me - so watch out - no mean feat because I hate having my photograph taken! Why have I called the feature "Mum on the Run"? Because it has many meanings. In a literal sense you may be running around - from home, to school, to work, out to lunch, back to the office, back to school - the list goes on. Or, you may be running from someone - yourself perhaps - or something - or to someone - or something. Perhaps you are running on empty and need inspiration. Whatever it may be, I hope that Mum on the Run becomes a pleasurable part of your day. So, tomorrow is the day to get started. Let's see how we get on...Gulp!